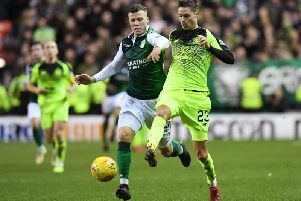 Hibs wrapped up second spot on Saturday with a very professional display against Peter Houston’s Falkirk. I envisaged a much sterner encounter with the Bairns, but I think Martin Boyle’s goal after just five minutes set the tone early on. Alan Stubbs had stated when he took the job he was eyeing a play-off spot at the very least so he’s achieved his goal in his debut season. I think he deserves an enormous amount of credit for leading us to second spot behind our city rivals. The mess he inherited last June would have been enough to send most rookie managers in the opposite direction, but has instead transformed us into a side who are now edging that bit closer to a top-flight return. This season’s Championship has been the most competitive for a number of years where the manager has had to be very astute in the transfer market with limited resources to do so. However, he has recruited exceptionally well with the players he has brought to the club and that bodes well for the future. We can now enter the play-off first leg against either Rangers or Queen of the South with a great deal of optimism. I think both sides are capable of causing us problems on their day but I am confident we have the ability to see either team off over two legs. The players will be in a good frame of mind having put the demon of Falkirk to bed on Saturday but will know only too well what lies ahead of them in the coming weeks. Every game will need to be treated as a cup final with very little room for error. The players know what’s at stake where the prize of promotion can drive them on.